We conclude our discussion series on The Gift of Work this week with Heatley’s closing reflection on the powerfully influential, yet carefully boundaried place our jobs have in our lives. Being an enthusiastic proponent of the gargantuan significance there is in the body of believers being scattered throughout the workplace, I’ll begin there. Heatley identifies this potential influence as “informal authority.” I believe this influence lies at the crux of the free and responsible stewardship of our lives. What it means at work is that within the context of our job itself, our profession, our field, we have a creative and redemptive role to play. We participate in the content and direction of medicine, law, education, fashion, entertainment, public safety, architecture, research, art, etc. etc. We do not need to avoid immersing ourselves in the issues of our job in order to avoid absorbing the values of the world. If in our efforts not to lose our way by making too large an investment in our jobs, we risk missing our callings by making too little an investment in our jobs. Having said that, Heatley wisely warns against searching for aspects of life in one’s job that one’s job can never provide. Hence the boundary. Valuing family, other communities, other forms of service, rest and reflection all build and sustain a healthy, whole human person. We want our lights to shine, but we do not want them to burn out. We want to make a difference for God by being one of his in our respective jobs, but we want to do so in a way that makes us and those around us more fully human, not less. Thanks Bill for a great contribution to the many believers desiring to show up at work both fully engaged in the task at hand and fully participating in God’s redemptive work in the world. Each week I post my reflections from one chapter of The Gift of Work by Bill Heatley. If you are just joining the discussion now, we are concluding our discussion today. Catch up on the entire series here. Next week join us as we begin reading Integrity: The Courage to Meet the Demands of Reality by Henry Cloud. Prepare and tend the soil. The metaphor cuts across my tendency to complicate and over think my views on work and faith. My best bet for contributing to a healthy and bountiful crop is to prepare and tend the soil. My best bet for contributing to a meaningful and productive workplace is to become a certain sort of person. Instead of attempting to control the production process (which by definition in this metaphor is out of my control), I should focus on becoming the sort of character who can participate well whatever the process. Becoming a certain kind of person is in my control. What sort of person? A learning person. An engaged person. An attentive person. A healthy person. A grounded person. A God-connected person. A maturing person. That’s my term for what Bill Heatley identifies as ethics that confines itself to avoiding either litigation or offending people. There’s a problem with defining or limiting anything to what it is not. I hear the grieving of what has been lost in terms of moral vocabulary, social mores, and behavioral standards. Being the veritable pragmatist that I am, though, I want to move immediately to thinking through creative options for facing this current reality, however tragic, and creating, developing and experimenting with alternatives for maturing into a working community that is, in fact, characterized by love, goodness and justice. Integration. A whole person whose whole life flows out of and reflects a common core. A complex and beautiful tapestry, whose many and seemingly unrelated threads combine in a single yet endlessly creative and generative work of art. Many of us who share a Christian spirituality struggle to relate our faith and our work. They seem to function in separate categories, and that’s just fine with us thank you very much. The links our religious leaders suggest (be ethical, strive for excellence, convert co-workers, etc.) feel like a reach and we intuit the deep disconnect. Bill Heatley suggests an insightful and helpful alternative. Instead of two separate compartments that need to be connected, he offers God as the reference point out of which and from which all of life flows. My head spins with all the different definitions of success out there. Even if I can think myself through their various fallacies, the measures of success in this culture still haunt and lure and accuse. What I need, though, is not another critique of the culture’s twists and perversions of the truth. Nor, on the other hand, do I need another vague, conceptual affirmation of the eternal biblical principles by which my work should find its purpose, motivations and methods. So I especially enjoyed Heatley using four work-based categories, (success, competition, loyalty and service) to think through the shortcomings in most workplaces and the alternatives a faith-based perspective would contribute. While I agree that “love” holds the key to unlocking the creative juices that will eventually result in a plethora of practical alternatives emerging in workplaces around the world, I’m anxious to get on to brainstorming what these practical alternatives might be. For example, let’s take a variety of workplace processes: hiring, training, firing, planning, meetings, compensation, performance reviews, approval processes, budgeting, adopting new technologies, etc., and having teams work through what those need to look like if we’re to achieve, “market strength, employee focus and customer value.” In other words, put some feet on love in the context of work. How do you find ways to give practical form to your faith-based values at work, in the context of work’s issues, processes and structures, and within a culture where work is a daily reality on which our survival depends? 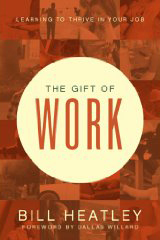 Each Friday I post my reflections from one chapter of The Gift of Work by Bill Heatley. If you are just joining the discussion now, welcome! Catch up on the entire series here. From the outside in… practicing habits of healthy living until proficient. From the inside out… becoming increasingly open to the involvement of God in the training process. Such are the spiritual disciplines: twin and simultaneous trajectories toward becoming the kind of person you were meant to be. Reflecting on the workplace, it is my stewardship of the life God has given me that determines the character of my presence and contribution there. Hence the power of Heatley’s now obvious, but usually overlooked, linkage between our stewardship within God’s kingdom with the role of kings. How I show up matters. Whether or not I choose to engage fully—authentically, energetically and creatively—matters. I’m going to jump right into the issues raised by Bill Heatley’s The Gift of Work: Spiritual Disciplines for the Workplace without much content summary. So grab your copy and join the fun! Powerful from the get go is his challenge to our basic frame of reference about work as “a daily humiliation.” (p. 24) Such starting assumptions: work is but a necessary evil to pay the bills, TGIF, and working for “the man”—among others—is where we get our equation backwards. It’s as if we suspend our lives while at work in order to make the money we need to finance the lives we want to live while at home. We have to get ourselves dirty in the workplace (read “the world”) in order to serve God and others everywhere else. Instead of investing, engaging, reflecting and improving, we end up keeping work at arm’s length. A huge hurdle to becoming open to alternate frames of reference is learning how to identify our own starting assumptions. It can be like asking a blind person why they tripped on the cracked sidewalk. How can I figure out what I’m not seeing if I’m not seeing? We launch our first “Thought Leaders Unpacked” discussion series today with a look at The Gift of Work by Bill Heatley. For many of us spirituality and work operate in separate, unrelated compartments. But what if your work were an integral expression of your faith? What if you weren’t asked to change the subject to evangelism or early morning prayer groups or promises not to take office supplies home in order to think about what it means to be both a faithful employee and a faithful believer? Join me as I delve into this insightful piece. I’ll be posting my thoughts chapter by chapter, and hope you will interact with your own comments, insights and opinions. Get your copy and read along!